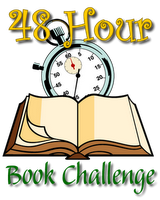 Well, I'm over halfway through my time slot in the 48-Hour Book Challenge. I'm at 16 hours of reading & blogging so far and I have until 2:30pm tomorrow, but we'll probably be leaving for Father's Day lunch earlier than that. I've slowed down tonight because I'm pretty tired and I'm having a little trouble figuring out what book to pick up next. I did spent some quality time with an audiobook (Aziz Ansari's Modern Romance), but I'm heading to bed soon. Hopefully I will wake up with lots of energy tomorrow and get through the last 4 hours I need to meet my goal! How's the challenge going for you?